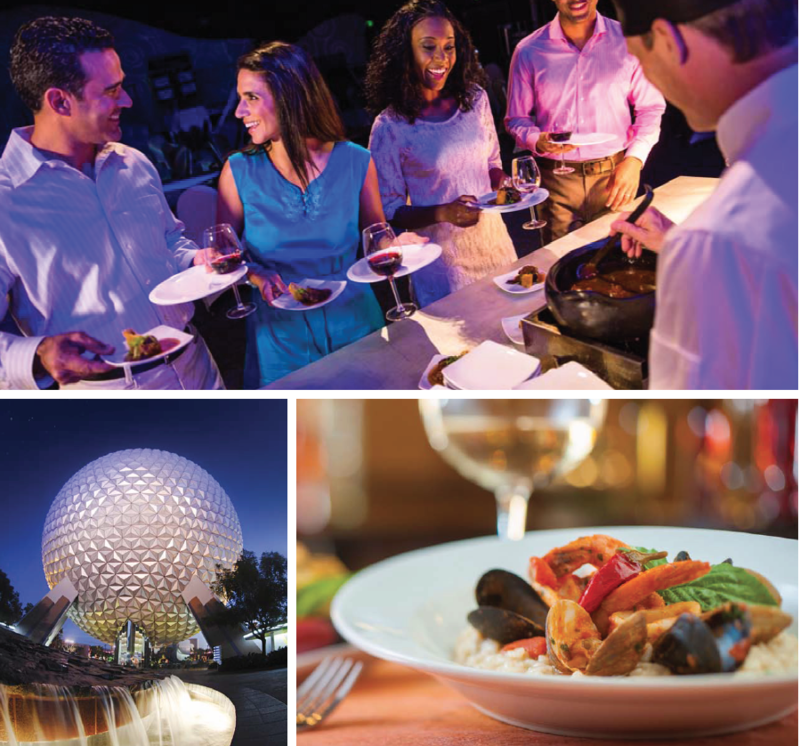 For twenty years now, the Epcot® International Food & Wine Festival has brought incredible Disney dining, drinks, music, and culture from all over the globe to one incredible event for food fans and Disney fans alike. This year, the festival runs from September 25th to November 16th, and Disney Visa Cardmembers have opportunities to experience one-of-a-kind access to tasty events and a relaxing retreat that make this beloved celebration even more delicious! Take a glimpse behind the scenes of The Making of Party for the Senses-From Idea to Implementation while enjoying a lunch of world-class dishes like Malbec demi-braised pork chops with shaved truffles, paired with beverages in the Wine View Lounge and followed by a dessert station provided by the festival’s finest pastry chefs. This exclusive event occurs October 27th from 12:00 pm to 1:30 pm, for $125 per guest plus tax. Meet an Imagineer, a Festival Chef, and a Beverage Professional who will discuss the ins and outs of the Festival’s signature Marketplaces as breakfast is served, including beef tenderloin, Yukon Gold hash, and a New England lobster roll to kick off a day of festivities. This exclusive event occurs November 9th from 8:00 am to 9:30 am, for $99 per guest plus tax. Cardmembers can also enjoy our Character Meet ‘N’ Greet. Learn more about Disney Visa Card perks! Find out how your Disney Visa Card sweetens your Disney vacation experience at the 20th celebration of the Epcot® International Food & Wine Festival. Offer made by Chase. Disney and its affiliates are not responsible for offer fulfillment. By entering and using the Chase Lounge, attendees agree to abide by all rules of the Chase Lounge and to conduct themselves in an orderly manner. Failure to do so may lead to expulsion from the Chase Lounge. Participants agree to release and hold harmless the officers, directors, employees, agents, and assigns of Walt Disney World® Resort, Chase Bank USA, N.A. and their respective successors, and affiliates, from any and all liability or damage of any kind resulting from or arising from the use or misuse of the Chase Lounge. Cardmembers can visit the Chase Lounge from 11am-9pm on Sunday through Thursday and 11am-10pm on select Fridays and Saturdays during the Festival to enjoy the complimentary amenities as long as capacity allows. Separate Theme Park admission required. Each Cardmember may only bring 5 guests into the Chase Lounge. Separate Theme Park admission required. Gratuity included in Event price. Alcohol will be served only to Guests 21 and older. Events subject to change or cancellation without notice.